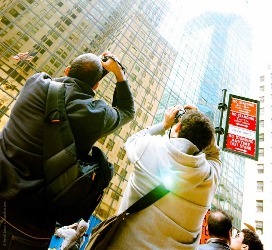 citifari is the healthy and safe way to see New York City under a different angle. Join our career New York City photographers (check their amazing bios) in a small group for our photo tours. Our photographers share decades of experience for you to get the essence of New York through their passion. We have already diligently scouted NYC for the most unique vantage points for you. During the 2-1/2 hour walking tour, we share these privileged corners of NYC along with various, must-have, techniques so you can shoot your own stunning photographs. Your photographer directs you safely to the most appropriate location for each picture, instruct you and provides you with feedback regarding composition and the settings of your camera. Through our intimate workshop we will take you off the Automatic and to Manual mode of your camera. You only need to bring your best camera and walking shoes. Please read your camera's manual and be ready to adjust your camera in manual mode. We have many tours every week, check our full schedule to see when you can join us. We recommend that you take our photo tour early during your stay so that you can use the benefits of your experience through the duration of your stay (and non-photographers can come along). what are we doing during the tour? Our photographer walks you to a selection of vantage points and explains how you could take specific, impressive 'photographer-like' shots of New York City's most iconic locations. Should you need it, our photographer-guide helps you with your photo skills for each shot, you just need to be a photo-enthusiast. Not sure what tours suits you best? Check our reservations page. Our landmarks photo tour (also nicknamed Concrete Jungle Safari) includes the New Yorker Hotel, the Empire State building, Grand Central Terminal, the Chrysler building and the UN building. The photo tour of Central Park takes you around the lakes, bridges and other attractions with a view of the Manhattan skyline that makes Central Park so unique. The night photo tour and workshop teaches night photography techniques while discovering the "darker" side of the city that never sleeps: the UN headquarters, 42nd street, Grand Central Terminal, the Chrysler Building, Rockefeller Center and Radio City Music Hall. Last but not least our SOHO photo tour takes you around in this buzzing neighborhood and helps you photograph with new angles where many photographers have already made this neighborhood an unforgettable part of New York City.